St. Louis, MO – Andrea Miller, President of the National Institute for Reproductive Health (NIRH) and NIRH Action Fund, released the following statement today decrying St. Louis’ failure to pass Board Bill 34, “The Buffer Zone Bill.” The ordinance, which failed by a vote of 15-9, would protect women accessing abortion care by creating an eight-foot buffer zone around St. Louis’ only abortion clinic. Studies show that efforts to disrupt services at abortion clinics have proliferated over the last 10 years, with more than 200,000 reported acts of intimidation or violence, including arson, obstruction, and burglary among others. 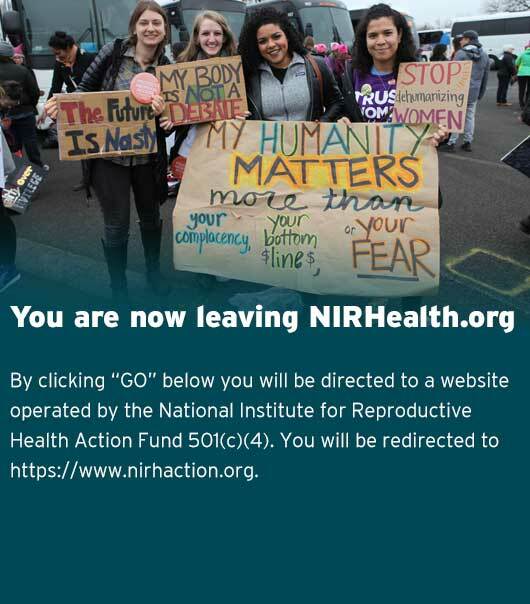 NIRH has partnered with NARAL Pro-Choice Missouri for the last two years to pass local level policy that expands reproductive freedom. Last year, with the support of NIRH, St. Louis became one of the first cities in the country to pass a Reproductive Health Nondiscrimination Ordinance. St. Louis originally earned a two out of a possible five stars in NIRH’s 2017 Local Reproductive Freedom Index. NIRH will re-evaluate the reproductive health, rights and justice policies of the most populous U.S. cities in order to reflect improvements that cities make during that time.